Jerald A. Hanson joined his father’s insurance agency in 1977 while attending college to earn a degree in business management. He learned from the master. Their office located in Riverside, California, serviced business organizations and families in the Southern California area. Jerry’s father retired in 1993 at which time he took over the ownership and management of the family business. Not enamored with Southern California, Jerry moved the business and family to Walla Walla in 1997 to enjoy the qualities of this wonderful community. Of particular interest - the academic, artistic and outdoors activities natural to our historical enclave. 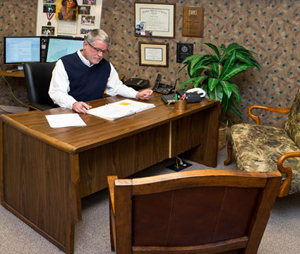 He chose the current office site in Downtown Walla Walla to begin the second phase of his career wherein the office continues to thrive to this day. Jerry and his licensed staff work hard to build long-term, trusting relationships with customers, taking the time to understand you, so we can serve you. Our licensed staff is experienced in all forms of family, farm and business insurance. Stop in or call us today at 509.527.8702 to set up a consultation with us today! Or feel free to request a quote without having to leave your home, with our convenient online form!